North Carolina avenged its home loss to Duke in February with a 76–72 victory in Cameron Indoor Stadium on Saturday, and with it won the outright ACC regular-season title, its first since 2012. Duke made a furious rally late in the game, but Marcus Paige secured the win at the free-throw line. Much like the first time these two teams met on Feb. 17 in the Dean Smith Center, North Carolina was never able to pull away. The Tar Heels led for the majority of the time they’ve shared the court with the Blue Devils this season, but they could never distance themselves. Duke mounted a comeback on the road in the first game and, while North Carolina never trailed on Saturday, it couldn’t put Duke away either. The Tar Heels have an advantage in terms of physical size and depth, but this gritty Duke team was able to hang around. The Heels led by as many as 11 points and established a 10-point advantage in the second half, but the Blue Devils managed to cut the lead to as little as two. It would be an understatement to say North Carolina was dominant on the boards. UNC had a plus-35 advantage on the glass, grabbed six more offensive rebounds (27) than Duke had defensive rebounds (21) and senior forward Brice Johnson had just eight fewer boards (21) than Duke did as a team. The final count was a 64–29 advantage for UNC. Too often, though, the Tar Heels couldn’t capitalize on second-chance opportunities. On one possession, North Carolina had five offensive rebounds but didn’t score. Duke compensated for its lack of rebounds with a steady barrage of three-point attempts. More than half of the team’s shots were from behind the arc, where the Blue Devils went 13 of 34. Two threes in the final 17 seconds brought Duke within striking distance and cut North Carolina’s lead to two. The Tar Heels, on the other hand, went just 4 of 23. If North Carolina had continued its season-average three-point clip of 31.6%, it could have cruised to a double-digit victory, but a poor shooting night from outside almost cost the Tar Heels another loss. North Carolina and Duke’s ACC Player of the Year candidates showed up big in their regular-season finales. Duke’s Grayson Allen had 29 points, five assists and four rebounds before fouling out in the final minute. North Carolina’s Brice Johnson had 18 points and 21 rebounds to bring his season totals against Duke to 47 points and 40 rebounds. Allen and Johnson have strong cases for ACC POY and All-America honors, and each will likely be unanimous All-ACC first team selections. • THAMEL: Coaching carousel: Could Rick Pitino be heading to the NBA? 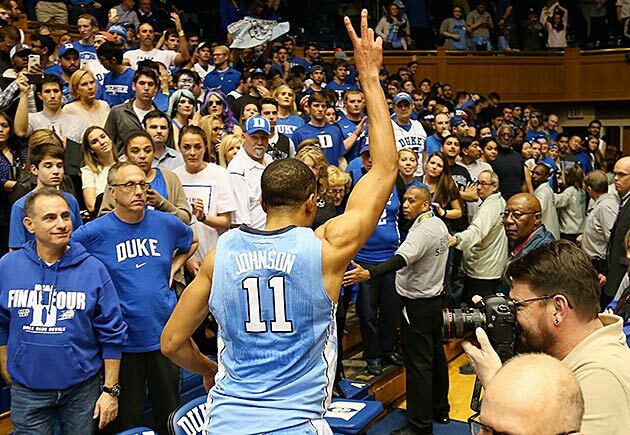 Since the 2012–13 season, neither Duke nor North Carolina had won the ACC regular season or tournament championships. Miami swept the ACC titles in 2012–13 and Virginia won both in 2013–14. Virginia and Notre Dame won last year’s regular season and tournament titles. North Carolina ended that streak on Saturday by winning on its archrival’s home floor for the first time in its last four tries, giving Paige and Johnson their first career wins at Duke. The ACC still has depth among the upper echelon of the conference—Miami and Virginia are vying for top seeds—but the Tar Heels claimed the 2016 ACC title outright, ending a combined conference championship drought for two of college basketball’s bluebloods.